One Japanese diver has been friends with the same fish for 25 years – and this is not a fairytale, guys. It’s for real. Hiroyuki Arakawa has been entrusted to oversee one of the Shinto religion’s shrines called torii, which is located beneath the surface of Japan’s Tateyama Bay. Over the decades, he got to know marine creatures who live around the shrine, and, most importantly, became buddies with a friendly Asian sheepshead wrasse named Yoriko. 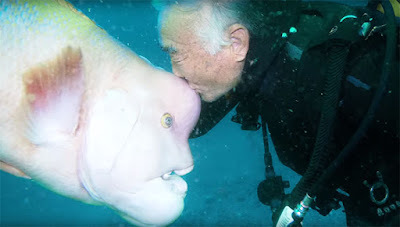 Their beautiful relationship was captured on a viral video, in which we see Arakawa’s custom of greeting the fishie with a kiss.One recent scientific study showed that fish can recognize human faces – and that’s a big deal. 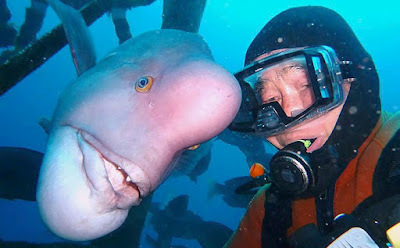 “Scientists presented the fish with two images of human faces and trained them to choose one by spitting their jets at that picture,” Dr. Cait Newport from Oxford University told CNN. “The researchers decided to make things a little harder. They took the pictures and made them black and white and evened out the head shapes. You’d think that would throw the fish for a loop. But no, they were able to pick the familiar face even then – and with more accuracy: 86%!” This new evidence makes the diver and Yoriko’s friendship even more inspiring and legit.